Celebrate in style on your wedding day with these stunning rose Temporary Tattoos. 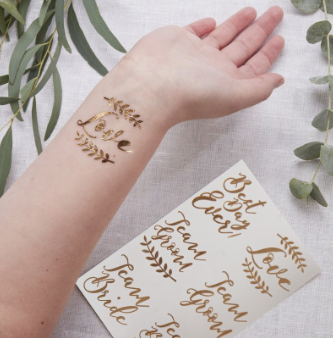 Have fun with your loved ones on your big day by applying the gorgeous metallic rose gold temporary tattoos to friends and family! Easy to apply and remove, these stunning tattoos are perfect for adding a little fun on your wedding day. Each pack comes with 6 different designs including: Best Day Ever, Love, Team Bride x2 and Team Groom x2. Each pack contains 12 temporary tattoos measuring 5cm (W) x 4cm (H).